AHAL/DASHOGUZ/MARY, Turkmenistan – Newlyweds Jahan and Dayanch sat in the waiting room of a small health clinic, about to do something extraordinary – they were about to receive a check-up of their reproductive health. Such a concept is largely unheard of in rural Turkmenistan, where women tend to wait until they experience a problem before seeking care. The waiting room was filled with women who had recently miscarried or who had difficulty conceiving. Some were seeking contraceptives. All saw the visit as a solution to a problem rather than a necessary part of maintaining their health and well-being. But a new effort by the Government and UNFPA is trying to get people to see things the way Jahan and Dayanch do. Hoping to start a family, they both wanted to see reproductive health doctors as an important and routine part of managing their health. 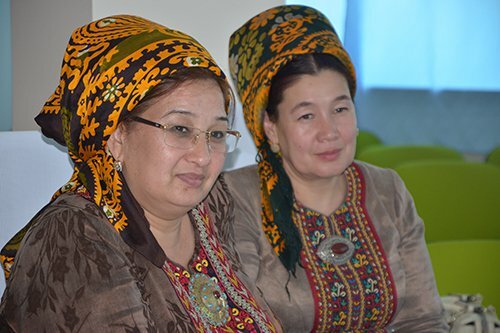 In mid-July, the Ministry of Health and Medical Industry of Turkmenistan announced a “Month of Women’s Health,” a UNFPA-supported campaign that would raise awareness among women about the importance of maintaining their reproductive health. The campaign encouraged women to visit their doctors, and spread the word about important, but underutilized, services such as cervical cancer screenings. Free cervical cancer screenings and reproductive health counselling were made available around the country throughout the month. Yet too few women receive routine screenings. Many don’t even know about them. But the campaign made an impact. During the women’s health month, more than 140,000 women received a reproductive health consultation and cervical cancer screening – 17 times the typical monthly average. More than 100 were referred to oncologists for treatment, and 26 were diagnosed with cervical cancer. “The number of women who have visited the reproductive health rooms for screening and consultation is amazing,” said Ms. Durdyeva. Family doctors played an important role in encouraging people to receive reproductive health care. “We had women go around the village and get others who were finished with their chores, and together they marched to the local hospital for the cervical cancer screenings and reproductive health consultations,” said Maya Charyeva, a reproductive specialist in Mary Region. The campaign also helped draw visitors to the country’s 94 'reproductive health rooms' – specialized clinics where people can receive sensitive and accurate family planning counselling, as well as other reproductive health services. Launched in 1997 with the support of UNFPA, the rooms also provide free contraception to at-risk women and girls. “Women are often reluctant to go to the oncology centre for cervical cancer screenings, but they are more inclined to do it at the reproductive health room. They know the doctor. They trust her, and it’s not as scary,” said a woman in Dashoguz Region. At the end of the campaign, women were interviewed about their experiences. Most said the efforts had made them think differently about their reproductive health. “This should not be a Month of Women’s Health. It should be a Year of Women’s health, or better yet, a regular practice,” a woman in Ahal Region said. Public health experts hope these efforts have a lasting impact. “We have a very nice trend of young couples visiting the reproductive health rooms to plan a healthy pregnancy,” said Zulfiya Sharipova, a reproductive health specialist in Dashoguz Region. “It is refreshing to see that the new generation is more aware of the health risks and takes better care of their own health, which then leads to healthy pregnancy, childbirth and healthy family,” she added.